Removing antiperspirant stains from clothing, upholstery or carpet can be difficult, unless you know the right steps. This is especially true if the stain is old, so the sooner you treat it the better. 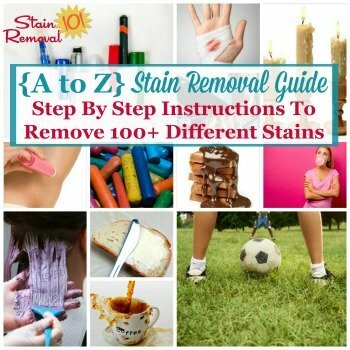 Below are step by step instructions for how to remove these stains, with the differences between how to remove old and new stains caused by antiperspirant. 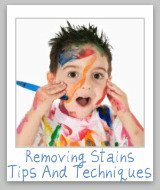 The age of the stain is important in regard to clothing, in particular, because sometimes we don't realize these stains have occurred for a while, and more steps may be necessary to get them out then. 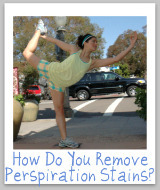 Step 1: Assess whether the stain caused by the antiperspirant is old or new. If it is old it will most likely have started to change the color of the fabric. Step 2a: If it is an old stain, then you should apply white vinegar to the stain, and let it sit for approximately 30 minutes. Step 3: Rinse either the vinegar or ammonia from the fabric and apply a laundry stain remover. Step 4: Launder in the hottest water the fabric will allow to get out the stain caused by the antiperspirant. Alternative method: If this method above for stain removal does not work, you may also try an extended presoak for the clothing in hot water and oxygen bleach. Step 1: Mix a solution of two cups warm water, one tablespoon dishwashing liquid, and one teaspoon of either vinegar or ammonia. Hint: Do not use both ammonia and vinegar, just choose one, because if you combine them they will neutralize each other's stain fighting characteristics. Step 2: Using this solution, sponge the stains caused by antiperspirant with a clean white cloth. Step 3: Next, blot at the solution until the liquid is absorbed. Step 4: Repeat steps 2-3 until the stain from the antiperspirant is removed from the upholstery. Step 5: Now that the antiperspirant is removed you should get plain cold water and a new white cloth and sponge the area to remove the cleaning solution, and then blot dry. Hint: Be sure to get the upholstery only as wet as necessary to remove the stain. Step 6: If the stain still remains blot at the stain with rubbing alcohol. The instructions for removal of stains caused by antiperspirant from carpet is the same as for upholstery. 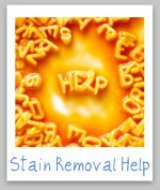 Perhaps you don't want to make your own stain remover, but instead want to use something designed to remove these stains. 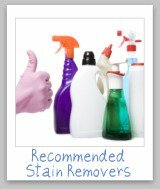 You can also share your own stain remover reviews here for other removers that work on deodorant, or any other stain. 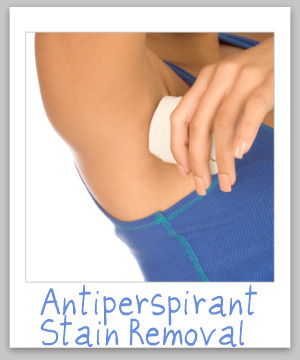 Do You Have Any Tips For Anti-Perspirant Stain Removal? 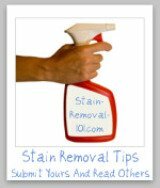 You can share your own tips for how to remove these stains here, or read other tips already submitted.